The Chinese New Year is just a week away from now and most of the Chinese families would be busy with spring cleanings and preparation for their reunion dinners on Chinese New Year eve. Some families would prepare steamboat dinners while others would cook some traditional dishes for the celebration. As for my family, we would gather for a steamboat dinner. On top of that, I would also help out in preparing some dishes for the following days. One of my favorite self concocted dishes which I had cooked for the last few years would be my so-called Eight Precious Jewels of Asia. In short, it’s BRAISED OYSTERS AND SCALLOPS which had eight wonderful combination of seafood, meat and nuts. There’s a secret to this dish. I had used Chabot’s Napoleon Armagnac 1998 brandy to pep up the taste. It even got a thumb-up from the experienced 64 years old chef, Malai Chong. Here’s the recipe but please take note that cooking this dish required lots of patience and time as each items would be cooked separately before combining all. Moreover, all the items are not cheap. A small bowl selling in some restaurants (not so much similar to the way I had cooked) would cost around $13-$33 (RM40-RM100) and they would use only 3-4 of the ingredients I had used below. – Cover the dried oyster with some hot water until soften. If the dried oysters you had bought were too hard. You can always pressure cook them (covered with water) for 15 minutes. Retain the juice for cooking. – Drain well and marinate with 2 tbsp each of ginger juice, sesame oil, 1 tbsp soy sauce, 1 tsp brandy/whiskey and a dash of pepper. – Cover the dried scallops with some hot water until soften. If the dried scallops you had bought were too hard. You can always pressure cook them (covered with water) for 15 minutes or steam for 25 minutes. Retain the juice for cooking. – Drain well and marinate with 1 tbsp each of ginger juice, soy sauce and 1 tsp sesame oil. – Cover the dried mushrooms with some hot water until soften. – Drain well by pressing softly but firmly. Retain the juice for cooking. – Cut off all the legs. – Marinate with the balance of the grated ginger (juice plus fiber), 1 tbsp soy sauce, 1 tsp sesame oil and 1/2 tsp fine sugar. – Soak the dried Chinese chestnuts with some hot water. – Drain well and use a toothpick to get rid of any remaining red skin still attached to the nuts. – Heat up a pot of water and boil the nuts for 20-30 minutes until the nuts are soft. Do pick up one to test out the softness as some brands of nuts or too dried ones would take a longer time to cook. – The easiest way would be by getting a tin of cooked ginkgo nuts or a pack of frozen precooked ones but it would not taste as great as those fresh ones. – If you happen to get hold of fresh ones, there would be more work involved. You would need to knock the shell and peel of the orange brown skin. – After all the hard work, you have to cook them in a pot of boiling water for 10-15 minutes. Drain well. Important Note: Please check with your supplier if the nuts are young nuts. Older ones would have well developed embryos/growth within and these would make the nuts bitter. Slit slightly on the head and get rid of the embryos before boiling them. – Soak the hair moss with some hot water. – Semi drain the hair moss while leaving some water inside (about 2 tbsp). – Marinate with 1 tbsp each of ginger juice, soy sauce, sesame oil and 2 tsp of brandy/whiskey. – Rub the pork with some salt and wash off. – Cut into 1.5” strips and slice thinly. – Drain well and marinate with 2 tbsp each of sesame oil, soy sauce, oyster sauce and a dash of pepper. Mix thoroughly. 1. You can combine all the retained juices in a bowl. Make sure you sieve the juice prior to using. 2. 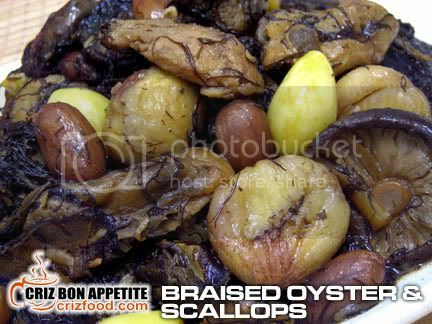 Heat up 2 tspn oil in a wok and sauté the marinated oysters to golden brown. Scoop and leave aside. 3. Heat up 1 tspn oil and sauté the marinated scallops to slightly brown. Scoop and leave aside. 4. Heat up 2 tspn oil and sauté 1 tsp chopped garlic until brown. Pour in the marinated mushrooms and sauté them until slightly brown and dry. Scoop and leave aside. 5. Heat up 3 tspn oil and sauté 1 tbsp chopped garlic until brown. Pour in the marinated pork, 1 tsp of dark soy sauce, 6 slices of ginger and stir fry them until cooked. 6. Add in 2.5 cups of the retained juice and simmer under high fire for 5 minutes. You can add in some hot water if not enough. 7. Lower the fire to medium and add in the Chinese chestnuts and the whole can of the braised peanuts. Simmer for another 10-15 minutes. 8. Add in the oysters, scallops and mushroom. Stir evenly and let it simmer until the water is halved. 9. Add in the ginkgo nuts and stir thoroughly for about 5-10 minutes. 10. Scoop up the cooked items into a bowl while retaining as much gravy as you can in the wok. 11. Pour in 1.5-2 cups of hot water and bring the gravy to boil. 12. Pour in the hair moss and let it simmer for 5 minutes. 13. Pour in the cooked items in the bowl and stir evenly. Lower fire and let it simmer for 10-15 minutes. You can add some hot water if the gravy become over dry as some hair moss would absorb more water. 14. Best served with white rice. Note: You can keep any remains in the freezer for weeks. When you need the dish, you could always defrost it and add some hot water to bring it to boil. Make sure that you let it boil until your preferred choice of dryness. Good Luck! I’ll have only dried oysters, hair moss, mushroom and pork knuckle. When do we have the chance to taste this harrrrrrrrrrr? Drip drip drip drip drip….you hear that??? That was my saliva dripping. This is definitely not for beginners like me. Anyway, will keep it….maybe one day I will need to cook this dish.